The victory in this war will be won by those nations which have the best and most abundant supply of food. Bread is more important than munitions. The nation that is hungry will first be ready to yield. We must see to it that none of the Allies is put in such a position. To this end everything that can be done to awaken the American people to their responsibility must be done. We must stop wasting food in our kitchens and on our tables, and we must conserve the whole of the food product that is edible. Our people must be taught how to eat in these times of stress. The teachers of home economics and domestic science throughout the country should be mobilized to carry messages to the people. The welfare of the nation is at stake. The success of our Allies is in the balance. It seems strange to speak of an army of diet experts, but such an army is just as important as one carrying modern rifles and sharp bayonets. So interesting. I had no idea that ordinary US citizens, with not necessarily any connection to the military, were engaged in their own way in this war, so distant from them. Women’s magazines from 1917 and 1918 are chock full of articles about supporting the troops by conserving food. Very interesting insight into the mood of the times. So often starvation and deprivation have been used in war – either as a weapon or as collateral damage. Although this advice was given, do you know if it was necessary this close to the end of WW1? The US was by th at time engaged in a full scale effort to supply Europe with foods and it was a pretty desperate effort. Russia was out of the game as a major European wheat producer because of World War One and, by this time, the Russian Civil War. Italy had scraped the barrel for troops and was short of farmers. There were American food relief programs going on in Italy. France was only a little bit behind Italy in those regards. The UK was relying on Irish food production which was stretched to the limit. Civil War in Mexico, which was still going on, was so bad that some regions of Mexico had entered a state of famine and in this month of 1918 it entered into a deal with Argentina for wheat. In short, much of the worlds regular supplies of wheat were removed from the market, creating a huge wheat boom in the United States but also making the US and Canada the wheat supply for the world. Meat production in Europe was wrecked by the war by this point. Fishing in the Atlantic was disrupted by the war as well. Things were really bad. Political upheavals sure can affect food supplies. I hadn’t realized how global the food shortages were in 1918. Food prices were very high in 1917 and 1918, and my sense that many households were really struggling to feed their families due to the rapid inflation, Food conservation was both a patriotic act and a necessity in many families. 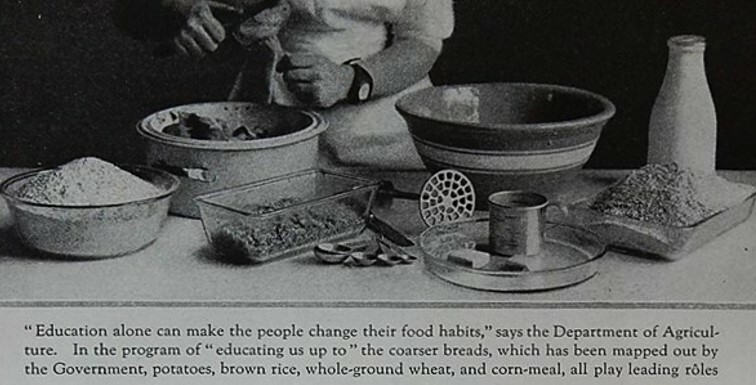 People were encouraged to eat less expensive foods – for example, substitute barley flour for some of the wheat flour in recipes, so that more wheat flour could be shipped to Europe to feed the troops. Political cartoons on this topic, fwiw, showing fat food wasters (usually in business suits in restaurants) and wearing German helmets were really common. Just a slight fwiw. The context is definitely different, but food waste was a concern both then and now. Food shortages during World War One, even in North America, were a much bigger concern than World War Two. We’ve just forgotten about it (as we have so much about World War One). The US never imposed rationing during WWI, like it did during WWII (although at least the State of Montana independently did). But the Federal government actively campaigned to save certain foods and encouraged people not to waste, and to eat substitute foods. Individuals and schools were urged to put in gardens. The government fairly early set up a campaign of Meatless (really beefless), Porkless, and Wheatless days, on all different days of the week. For American Catholics and Orthodox Christians that actually meant that they were doing two meatless days a week as the government put the Meatless Day on Monday (Porkless Days were on Tuesdays). To add to that mix, Monday was also as Heatless Day. I.e, a day you weren’t supposed to heat your home in order to save coal. I wonder what percentage of the households complied with the various “-less” day requests. During these cold winter months, heatless days must have seemed liked a major hardship. I can see my wife, who cooks most of our meals (I’ll do one or two a week, and have Sunday designated as mine) complying, but in our house there would have been complaints for two reasons, had we lived in 1918; 1) as Catholics we would have been doing a “meatless” day on Friday already and a second one would have been a bummer; and 2) as stockmen and hunters we’re not buying much store bought meat anyhow. Indeed, I’d have been inclined personally to disregard the Meatless Days if I was eating my own beef or venison anyhow. Of course, that supposes, I suppose, that I had a freezer, like I do now, which now occurs to me as being somewhat unlikely. Anyhow, Heatless Days seems really extreme and ill advised and I’d have a hard time with that one. Seems like a recipe for making people sick. How very interesting! What a great series, and what dedication on your part to research all this good stuff. It’s nice to hear that you enjoyed this post. Thanks for sharing the links. The posters are wonderful. The teens were really the golden age of posters. Even though I’m very familiar with the 1910’s, sometimes I learn new things. I hadn’t realized how popular they were back then. Sometimes we forget how hard those wars were on people, and how many sacrifices even those who stayed at home made. Thanks for sharing this! Until I saw the many articles in hundred-year-old magazines about high food prices and food shortages during WWI, I hadn’t realized how difficult it was back then. “Planting a garden showed patriotism, and food left uneaten on a plate brought scowls of disapproval. Sugar was rationed from May to December of 1918. As a result of these efforts, North Carolina produced four times as much food in 1918 as it did in 1917. Thanks for sharing the link to this wonderful article. It’s amazing that people canned 17 times as many jars of food in 1917 as in 1916. My grandparents, who lives through the war, must’ve instilled this kind of thinking in me, because I cannot bear to waste food. That generation lived through so much – WWI and WWII, as well as the Great Depression. It really affected how they thought about waste.